Have you heard of the Chop Keeper? 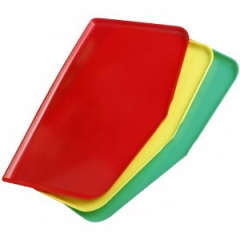 They are flexible plastic trays with raised sides; making them perfect for containing liquids. Imagine no more messy counters to clean. Hearing this you can imagine how excited I was to have a chance to review these trays for myself. I’ve been using my Chop Keepers for about a month now and would highly recommend them. While you can certainly use these trays for chopping; I reserve the Chop Keeper for things like meat preparation or transporting. They are great for carrying meat to/from the BBQ. Another plus is the trays are easily bendable allowing you to funnel the contents exactly where you need them. Again, avoiding a messy situation. You really can’t go wrong with these trays. I think it looks terrific and I hope I win! Pick me! Pick me. These look so useful. Would love to try them out. Looks like a useful tool! These look great! I love that they bend. What a good idea! I am always chopping something! No more tomato "goop" on the counter! Sounds like a great kitchen tool! I follow you on facebook and have the chocolate almond layer cake with ricotta filling to prove it! YUM! I will follow you anywhere and everywhere because you keep teaching me to cook better! I love the idea of the chopkeeper - its much more sanitary to have more than one cutting board and easier to use than the big wooden one I have been using. Hi!! I've followed you for awhile but I did like and left a message on fb. Fun!! Good morning from rainy Florida! Those chop keepers look great. What a neat idea. Any kitchen would benefit from these. Smile. What a fun giveaway! I've heard great things about these...and I love the bright colors. Thank you for sharing with me. Visiting your blog is a great way to start my morning. I hope you have a wonderful Wednesday full of good food and laughter. Hugs from Austin! These look awesome; I know my mom would love them -- she's always trying new cutting board inventions :) Oh and of course I'm with you FB and Twitter! These look super useful! Love that they're flexible so you can direct the food where it needs to go. Never heard of these before; neat! Thank you for your visit. The chop keeper looks like a very handy invention! Love it!